SAFE Project’s Treatment and Recovery Line of Operation provides resources, consultation, and programming to strengthen and advance community efforts to effectively respond to substance use challenges. SAFE Campuses was designed to create and strengthen efforts to ensure that collegiate recovery programs (CRPs) or other adequate recovery support services are present on every college campus nationwide. The program provides college students with the tools and support they need to succeed in the lifelong journey of addiction recovery. It also provides collegiate institutions with the knowledge and solutions necessary to effectively support students who are in or seeking recovery from substance use disorder. SAFE Campuses promotes healthy living and empowers college students in recovery to be positive leaders on campus and in life. Collegiate Recovery Leadership Academies are one program within SAFE Campuses. In collaboration with the Association of Recovery in Higher Education (ARHE), S.A.F.E. Project US is hosting a Collegiate Recovery Leadership Academy in the 2018-2019 academic year. Students who were accepted into The Academy are completing a year long (October-June) recovery-related project on their campus or community with the guidance of a mentor who has expertise in substance use disorder recovery. 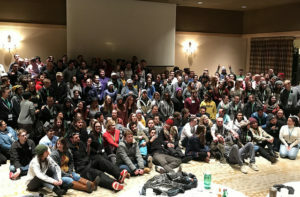 Accepted students also attended a weekend Leadership Summit in their region. The Academy will provide students with the information needed to create and strengthen efforts on their campuses and train them to be effective servant leaders.